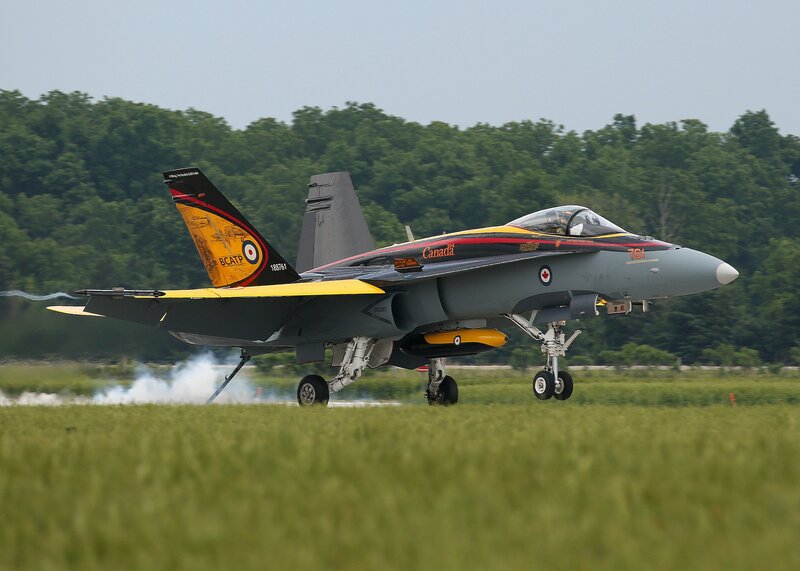 One of the Quinte International Air Show’s featured performers, a brightly painted CF-18 Hornet, lined up at the end of the active runway as the huge crowd waited expectantly for it to launch into its signature take-off routine: a steep climb, followed by the “Dirty Roll”. Then, Capt. 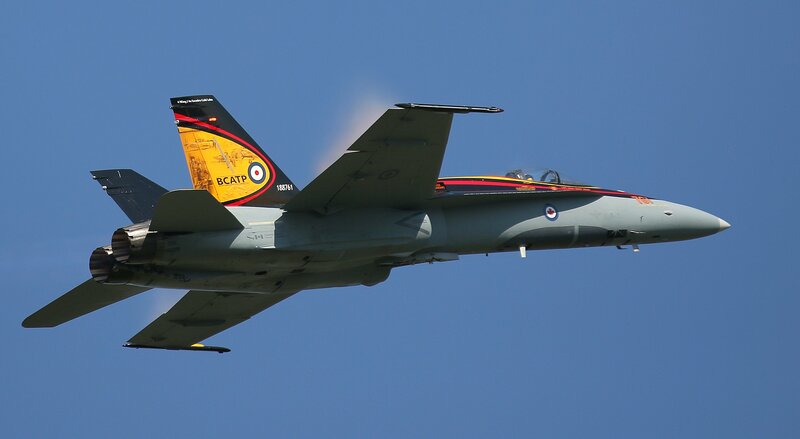 Ryan (Roid) Kean, the RCAF’s 2016 CF-18 Demonstration Pilot, quickly applied full military power to the twin GE turbofans, punched in the afterburners, and started his take-off roll. 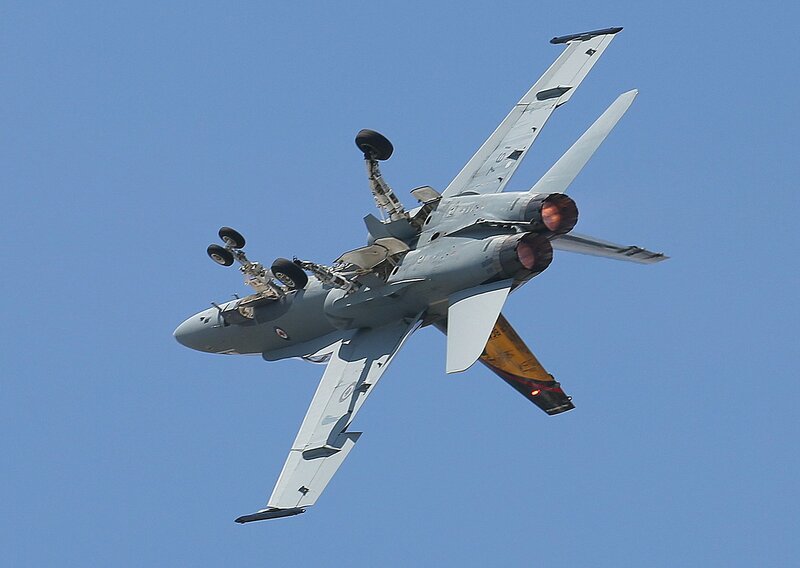 When he reached the precise speed of 170 knots, Capt. Kean yanked on the stick and immediately became airborne with nose up at 30 degrees. 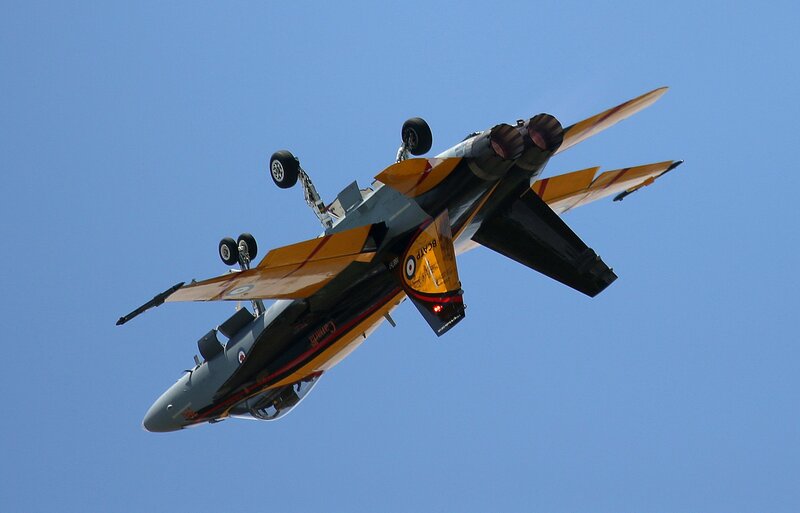 Seconds later he reached an altitude of 200ft and then, with the landing gear down, flaps lowered , and everything hanging out, he continued through 360 degrees of roll until the jet was once again rubber-side down. 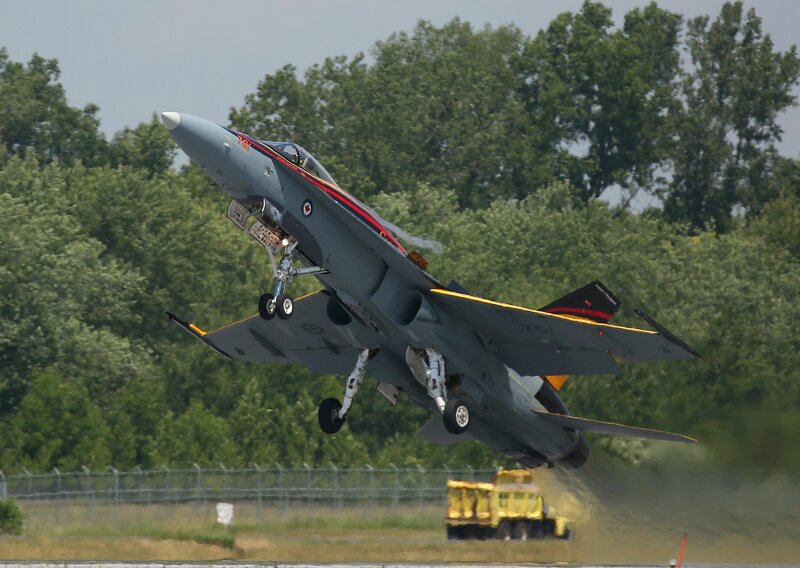 With this awesome manoeuver completed, the CF-18 Hornet demo bird was set up to perform an amazing array of high and low speed aerobatics that would showcase the skill and professionalism of the Royal Canadian Air Force. Capt. 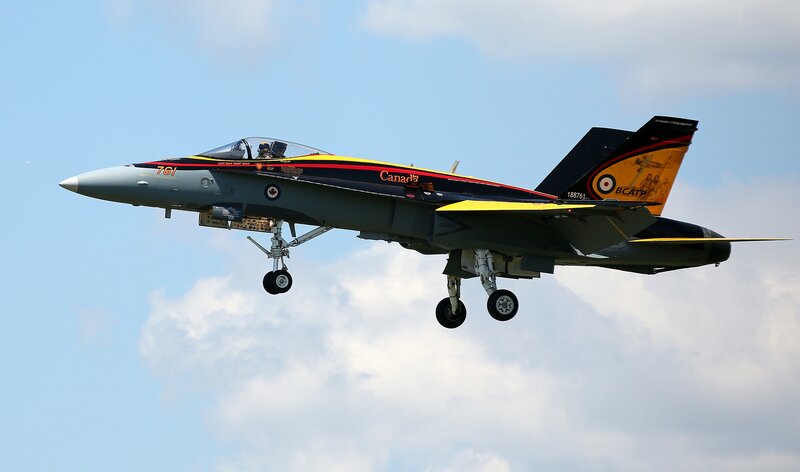 Kean commented on how the manoeuvers of the air demonstration routine were selected and put together into a balanced performance. 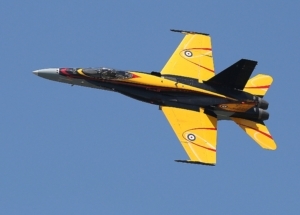 “It’s similar to the previous year’s program, with tweaks. 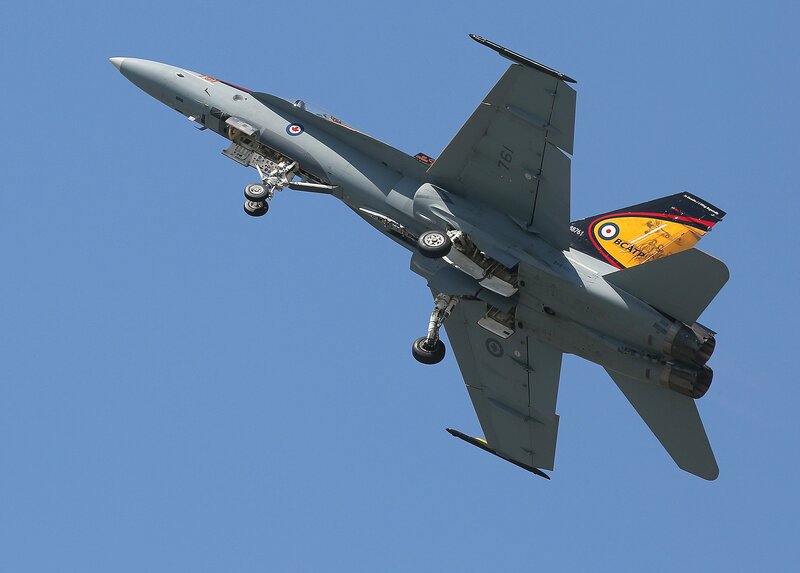 All of our approved performance manoeuvers come from our CF-18 demonstration training manual which is approved at the Air Division level. 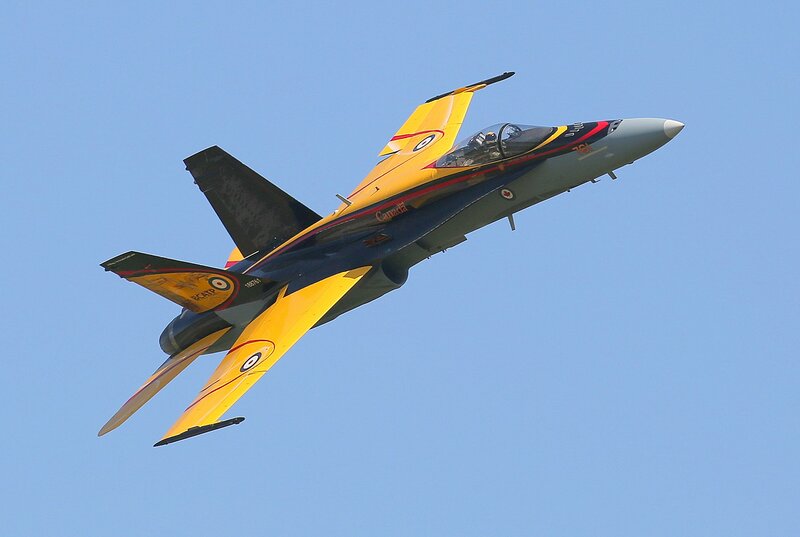 This year’s manoeuvers are then taken from this manual and the show is built from that bank of manoeuvers.” He also mentioned that the Air Demonstration Team is acutely aware of crowd safety and the demonstration has to fall within the guidelines of both Transport Canada and the FAA. 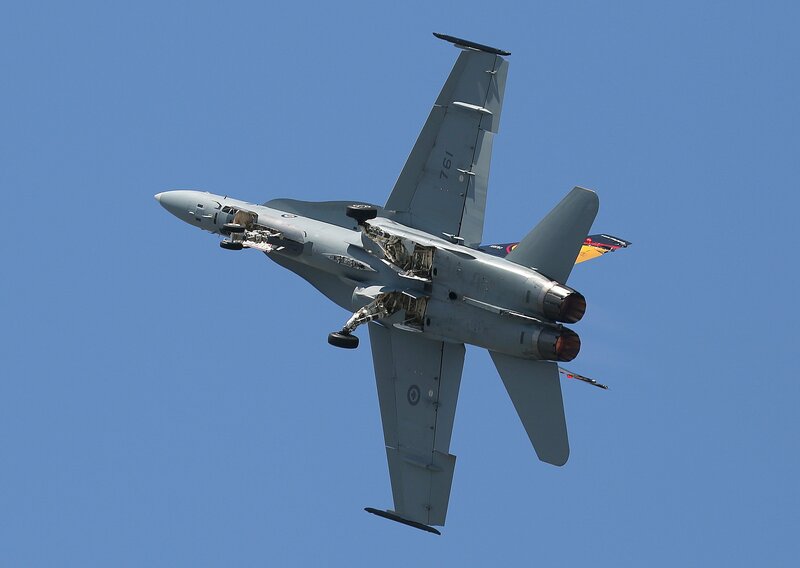 He described how important the simulator missions were to his training program. “As with most of my show routine, it’s all about speed. I get to sit in the simulator and practice hitting the speeds that I need to hit in each of these manoeuvers. When I am in the sim I look at the numbers rather than getting a feel for the aircraft. This is because I am always looking at numbers when I am flying the show routine; the simulator really helps with this aspect of the training. The other thing the simulator helps me with is practicing emergencies. If I want to pull an emergency simulation, it’s possible to bring up an emergency I might have during the demo. This allows me to see how it might affect me and then I can practice dealing with it”. 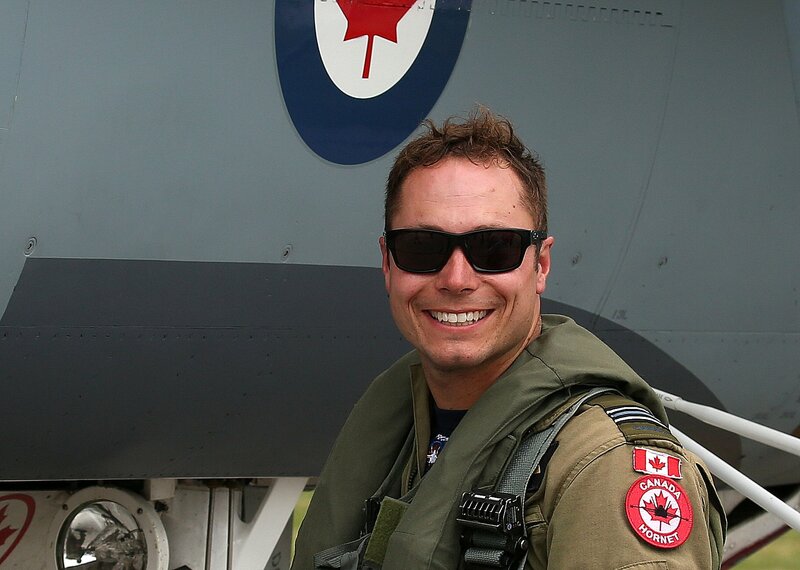 After being cleared for solo training flights, Capt. 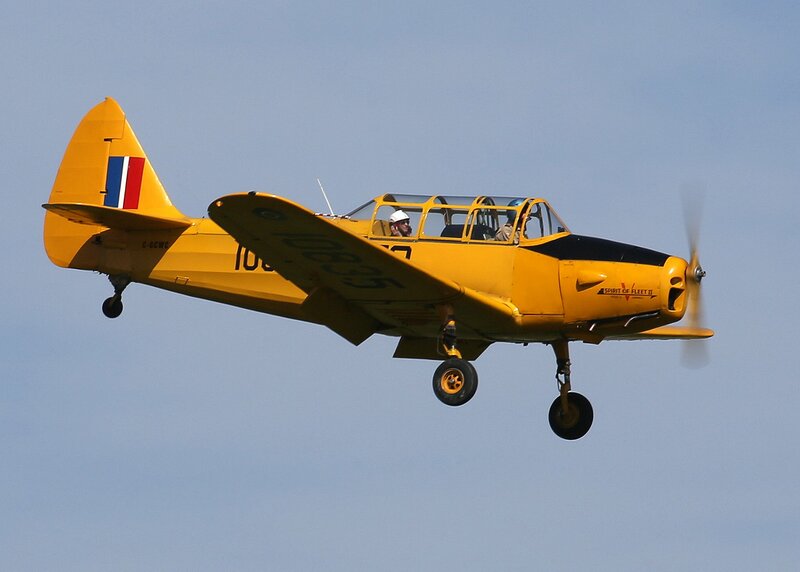 Kean then started his manoeuvers at higher altitudes and worked his way down to the show altitude of 300ft. When his training program was completed, but before the Demo Team took to the road and the skies, Capt. 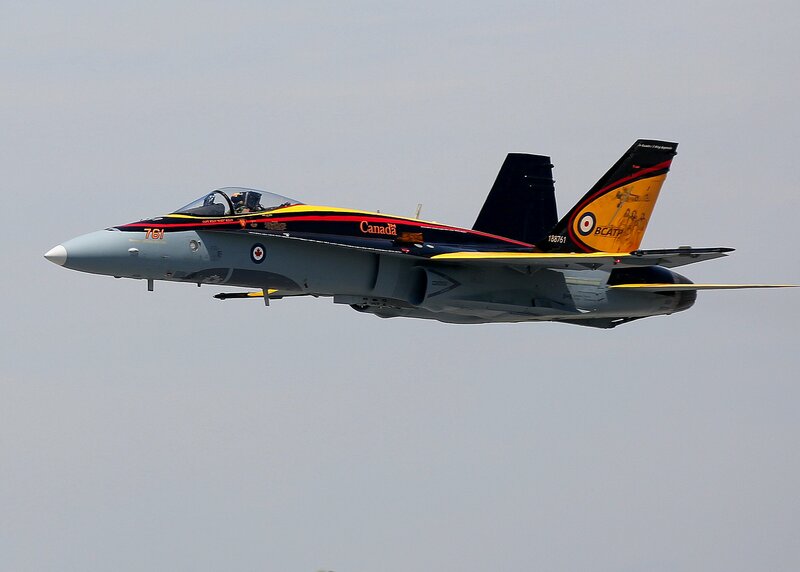 Kean performed his routine at CFB Comox, BC in front of Major-General Wheeler, the Commander of 1 Canadian Air Division. 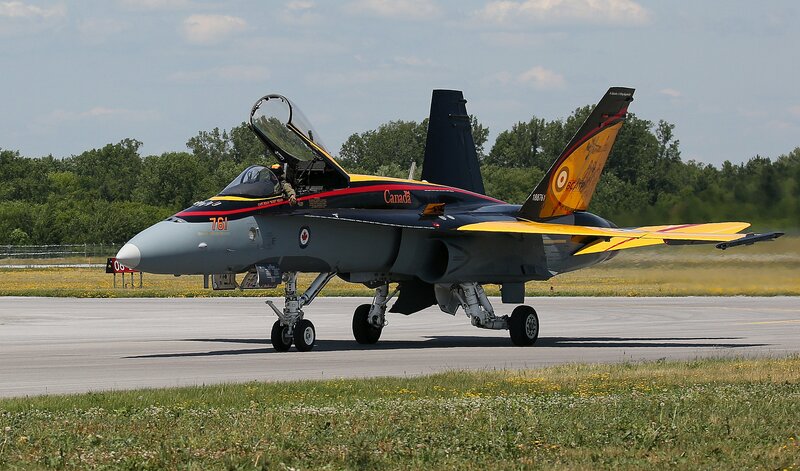 The General signed off on the CF-18 Hornet’s demo routine and then approved the show for the 2016 season. 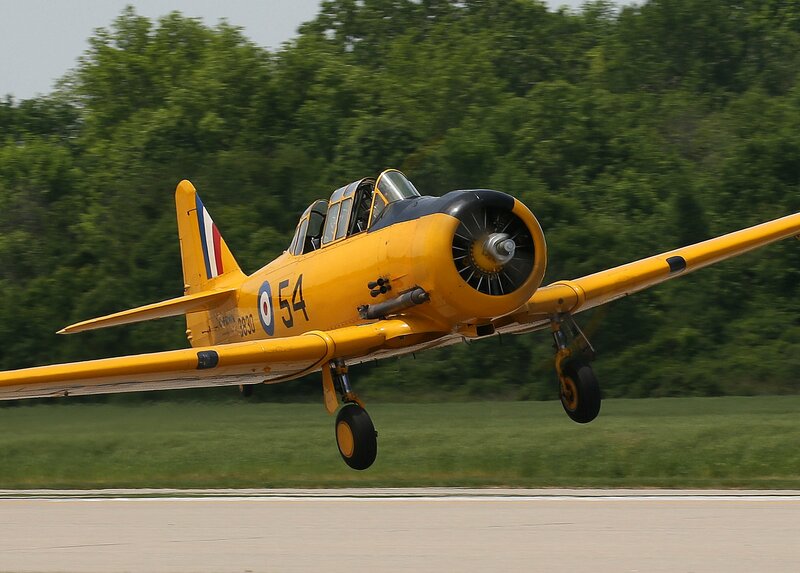 The Fleet Finch was used during the first phase of flight training for pilot candidates in the BCATP. The Fleet 60K Fort served with the British Commonwealth Air Training Plan and was used to train wireless (radio) operators. 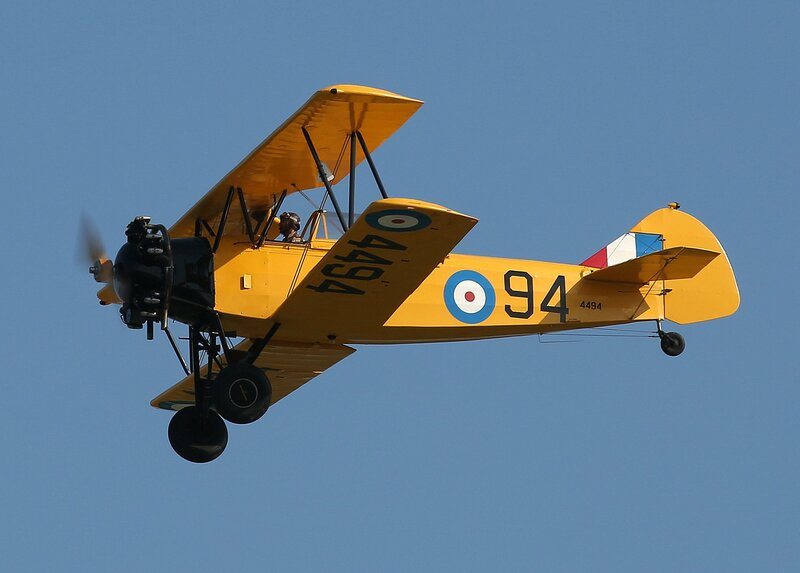 The Fairchild Cornell was the successor to the Tiger Moth and Fleet Finch for elementary pilot training in the British Commonwealth Air Training Plan. 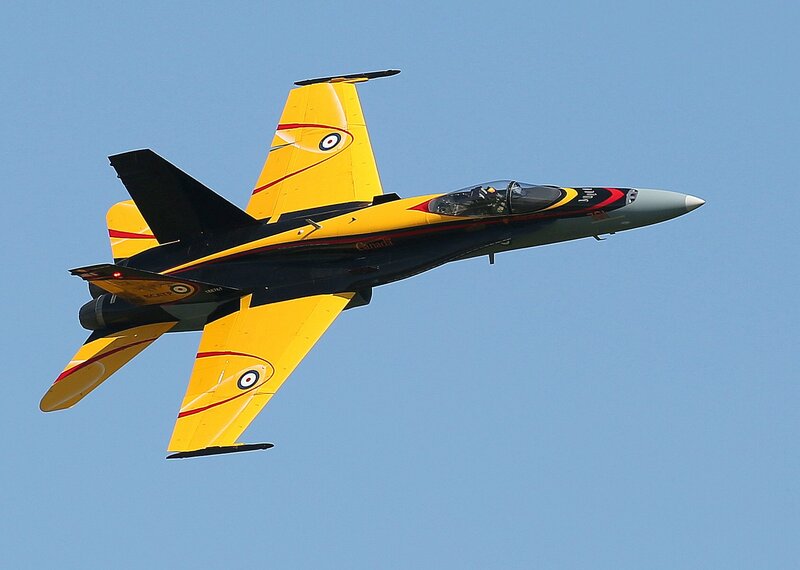 The jet features striking yellow wings, the colour of the primary aircraft used during the BCATP program, a black fuselage signifying the darkest days of World War II, and a red line for the “life line” the Canadian people made towards the war effort. 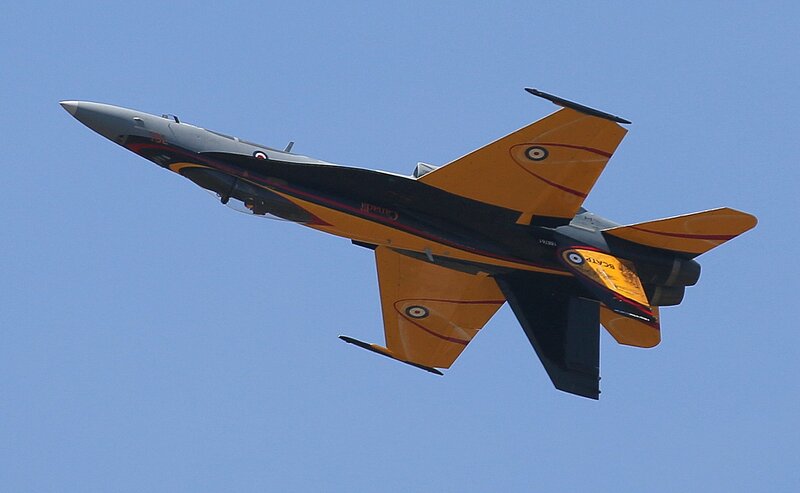 In addition, the names of all of the communities who hosted a training centre are painted on the jet. 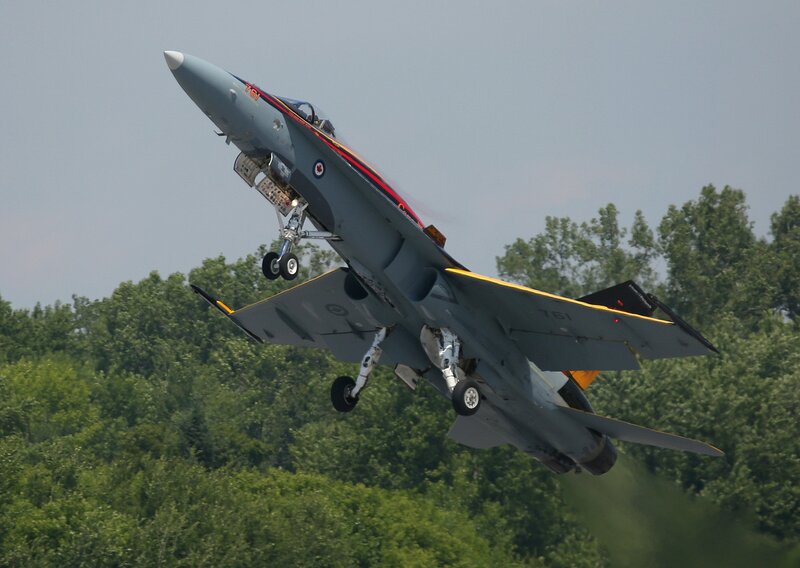 The CF-18 Demonstration Team has a heavy schedule of air shows during the 2016 season and will appear at 22 shows in Canada, 13 shows in the USA, plus many special visits to local communities, hospitals and schools. 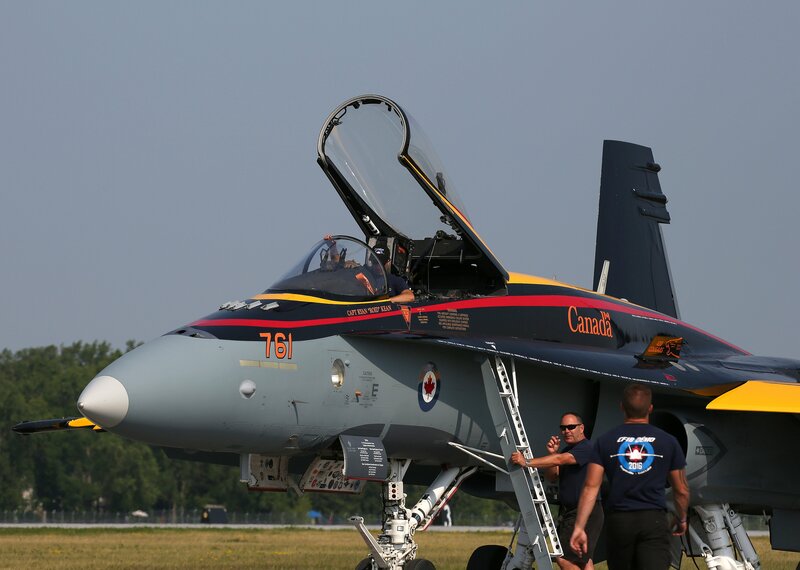 The CF-18 Demonstration Team is a highlight of the North American airshow circuit and gives the RCAF and opportunity to show the real side of their air force. 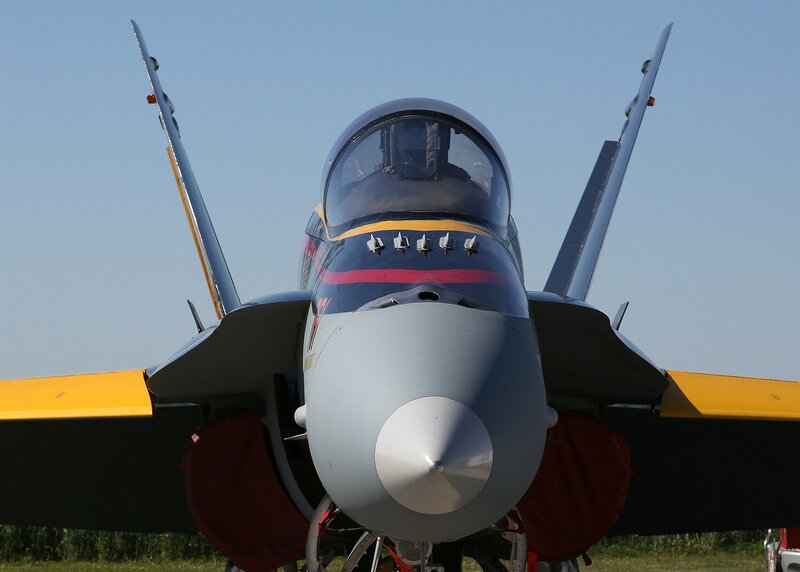 If you get the chance to attend one of the air shows listed below you will witness first-hand the outstanding skills and professional qualities of the men and women of the Royal Canadian Air Force. 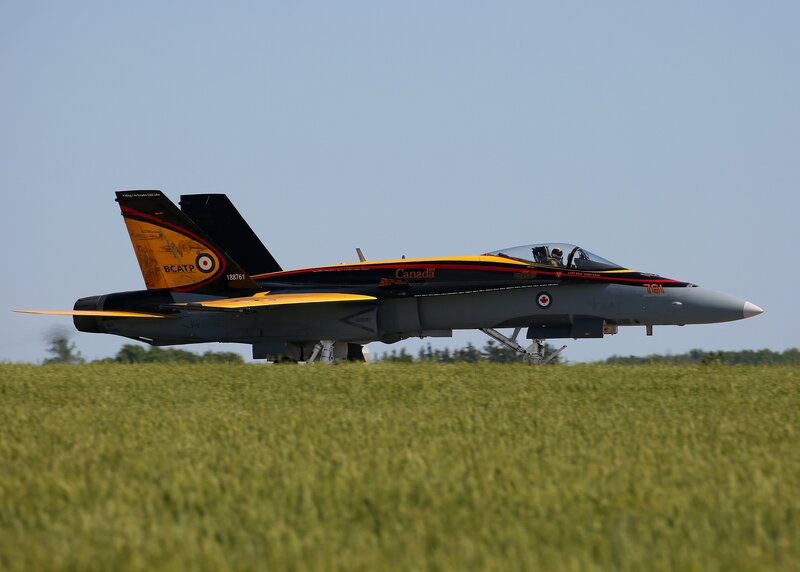 Many thanks for the support provided by RCAF CF-18 Air Demo Pilot Capt. 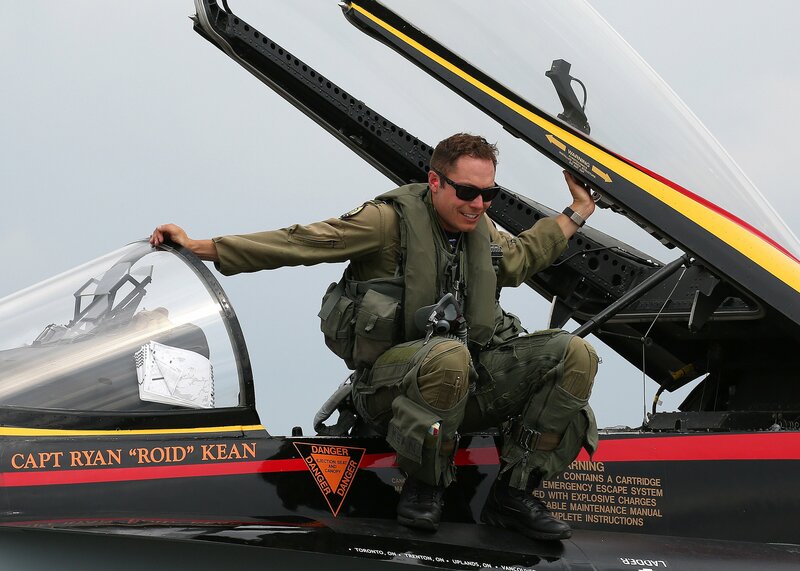 Ryan (Roid) Kean, Maj Holly Brown and their outstanding Demo Team. 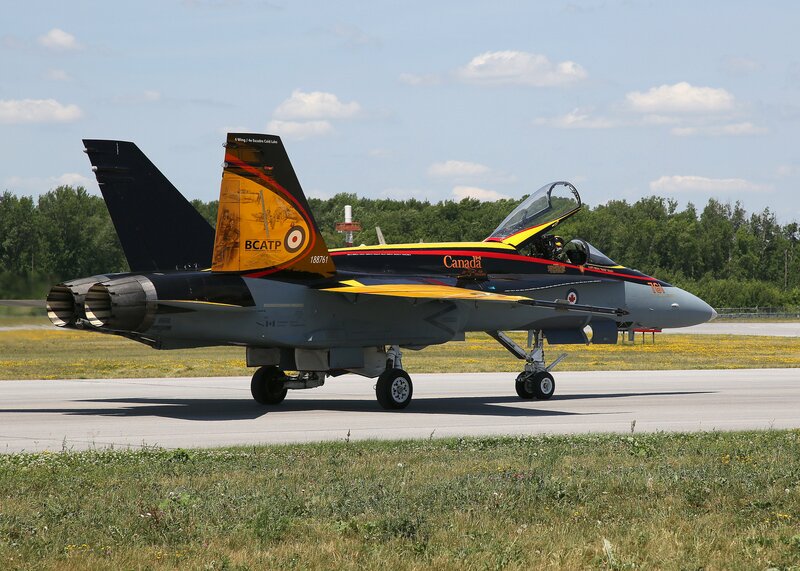 Also to the 8 Wing Public Affairs Office at CFB Trenton, particularly 2 Lt. Jennifer Howell, Lt. Karyn Blanchette, Capt. Julie Brunet and Capt. 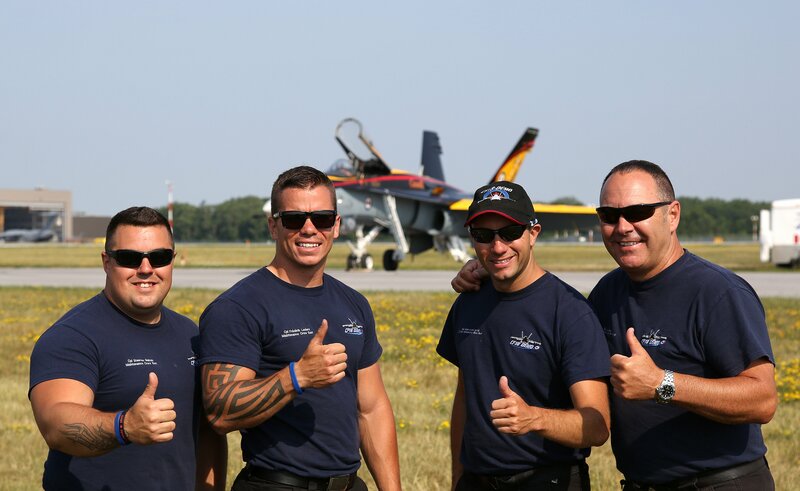 Andrea McKinley for their assistance during the Quinte International Air Show. 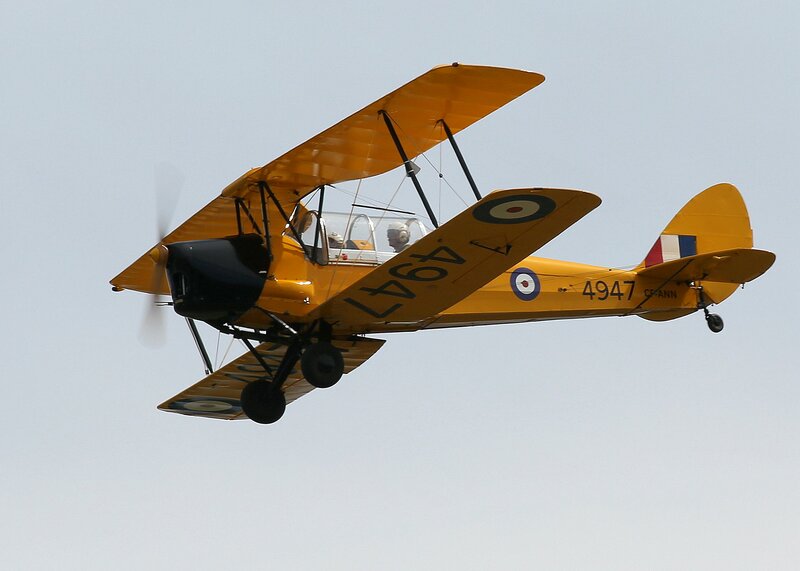 de Havilland Canada Tiger Moth was the primary flying trainer to instruct new pilot recruits of the British Commonwealth Air Training Program. 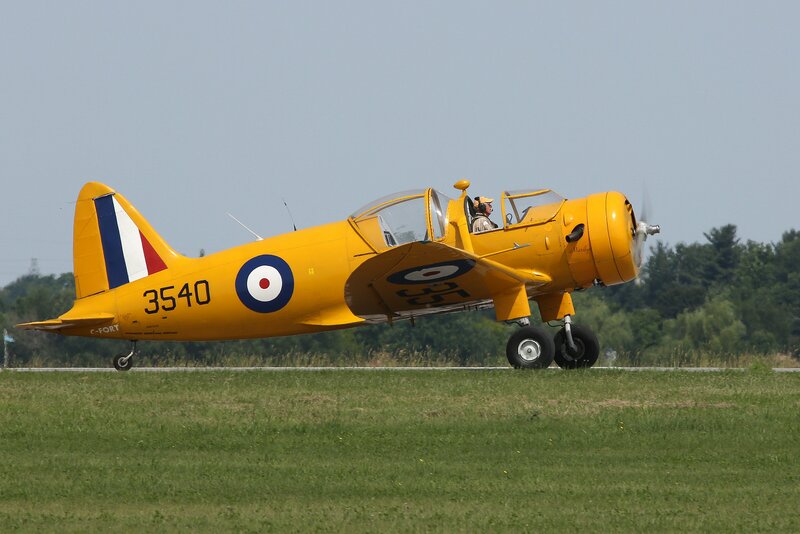 Nearly 50,000 Allied pilots received their wings on the North American Harvard. 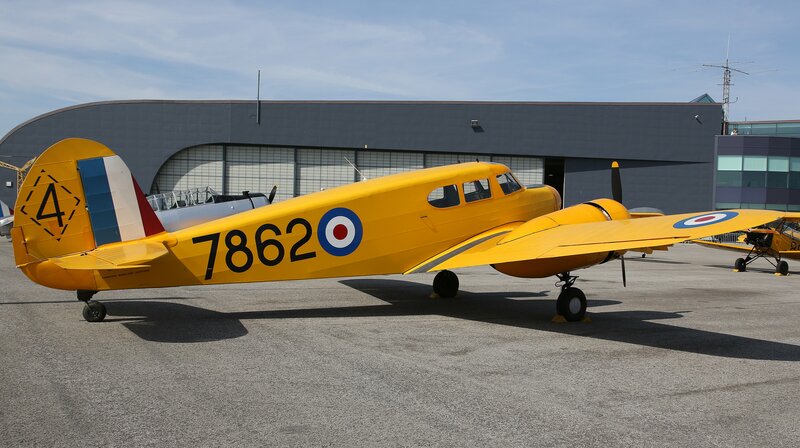 The Cessna Cessna MK 1 s/n 1355 was used in the BCATP for multi-engined pilot training, navigation training, communication and light transport roles. 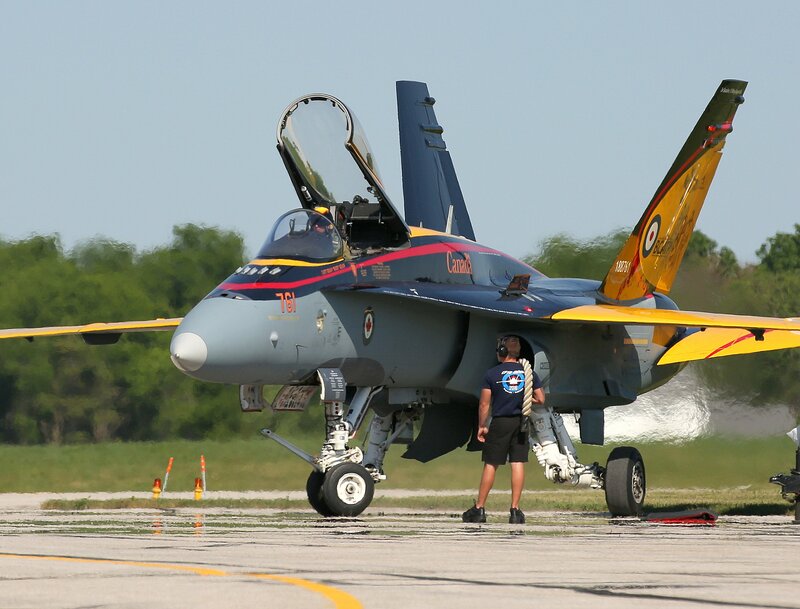 McDonnell Douglas RCAF CF-18 Demo Team Hornet taxiing out to the active runway. Barry Griffiths is a published author, wildlife photographer and naturalist. After a successful career as an educator, he became founder and President of Quest Nature Tours, a company specializing in worldwide nature tours and expedition cruising. 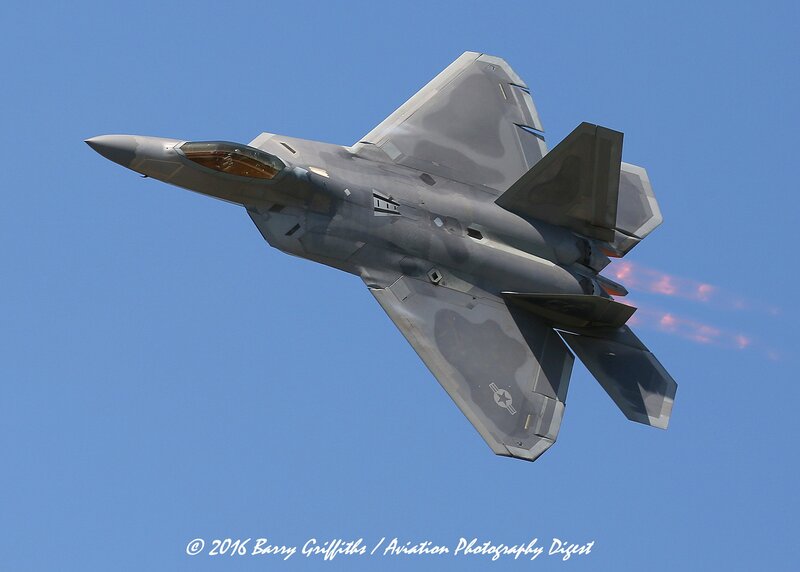 On his retirement from these endeavors, he continues to photograph wildlife and pursue his lifelong interest in all aspects of aviation.